September 2012: When young, Haribo was very shy and nervous but once socialised, he became a more confident individual. 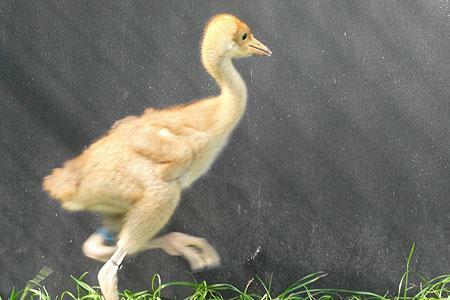 He was soon so confident, that he started to attack the shorter of the suited crane parents. Once in Somerset, he became really quite bolshie and annoying to be around if dressed in a crane rearing suit. For a while, he had a very dark neck with a blonde Mohawk on top his head - quite a look! At his transfer to Somerset, his feathers were in incredibly good condition - handy for keeping out the driving Somerset rain. 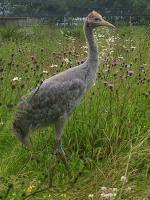 After release, he has been enjoying the space and freedom of the enclosure and taking some good strong flights. 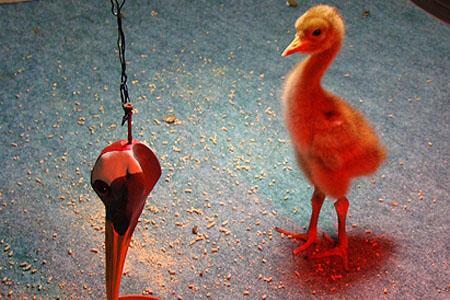 He was the first to fly on release day - and flies, like Chris from the 2010 cohort, with a dangly leg. January 2013: As autumn turned to winter, the cranes began to flock together to look for food, which they found in plentiful supply in the form of maize left in fields from the harvest. All 48 have been spending most of their time either feeding in the maize stubble or down on Stanmoor, completely unperturbed by the surrounding floodwater. January 2014: 2013 was a largely uneventful and quiet year for Haribo. The spring and summer were spent largely on Aller Moor and West Sedgemoor, with the autumn spent feeding on the Stoke St. Gregory Ridge, and Stanmoor, and the winter flood period on pasture land on Stanmoor along with the majority of the other cranes. July 2015: In spring 2014 Haribo formed a surprise partnership with Twinkle – a 2010 female. He was the only 2012 male to form a pair bond and hold a territory, at only 2 years old, on Wetmoor – which was particularly wet that year following substantial winter flooding. However, no breeding attempt was made. The two birds remained together within the main flock through the summer autumn and winter, on the Somerset Levels and Moors. 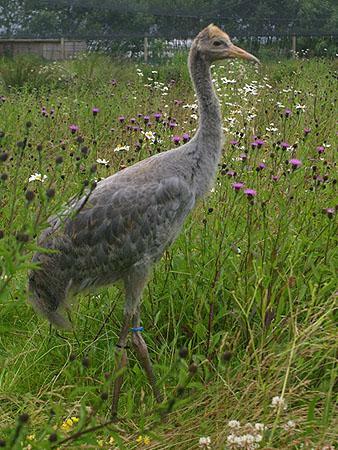 Spring 2015 saw Haribo once again courting Twinkle and the pair held a territory once again on Wetmoor – which this year, was not particularly wet, and we think, unsuitable for breeding cranes. They were seen there on an off through the spring, but by June were being seen as a non-territorial pair again on West Sedgemoor. They are not thought to have made a breeding attempt. February 2016: Haribo spent the winter on the Somerset levels and Moors but was seen early in the new Year back on Westmoor with Twinkle. Perhaps this will be the year they realy make a go of it? July 16: Set up territory on Westmoor . Incubation of two eggs started on 12th April. After 12 days the eggs were predated – probably by crows. There wereno further known nesting attempts. Nov 17: Haribo and his mate, Twinkle returned to their territory on Westmoor, Somerset in December and were observed there until late May. Seen frequently feeding together in different parts of their territory. There was no sign of nesting activity this year. They rejoined the flock in the Autumn though they are seen on their territory too. Sept 2018: Seen quite often on West Moor in Jan, Feb & March. Incubation started on 2nd April whilst the moor was inundated with floodwater but the nest failed on 11th April as levels receded Only one of the pair seen feeding on Westmoor 27th April (likely start date for second nest) and a 2nd nest was observed on 30th April. Nest failed on 17th May – cause unknown but site had started to dry out. No further nesting attempts reported.